Black + white. Always a chic favorite when paired together, and a duo I love to mix up a bit. I’ve had these pants on hold until I found a comparable blouse to play off the large checker print. The small gingham seemed just right. print mix perfection pretty lady! Pretty and sophisticated! It’s the perfect work outfit! This outfit is amazing. I love the mixed prints. The gingham is so delicate that I almost didn’t even notice it! I’ve been eyeing these pants every single time I go into Express. So cute on you! I love your lip color and your pants, you look beautiful! One of my favorite looks you’ve done…LOVE the mixing of prints! I love love love this pattern mixing! Such a great look! Love the pattern mixing! So cute and fun! I love those pants! This looks great! I’m always so nervous to mix prints but this looks great! This look is gorgeous! I would totally wear this to work. I love the mix of the gingham shirt with the striped pants. I also love Express pants they are always very flattering! I like windowpane plaid mixed with gingham! You look great btw. 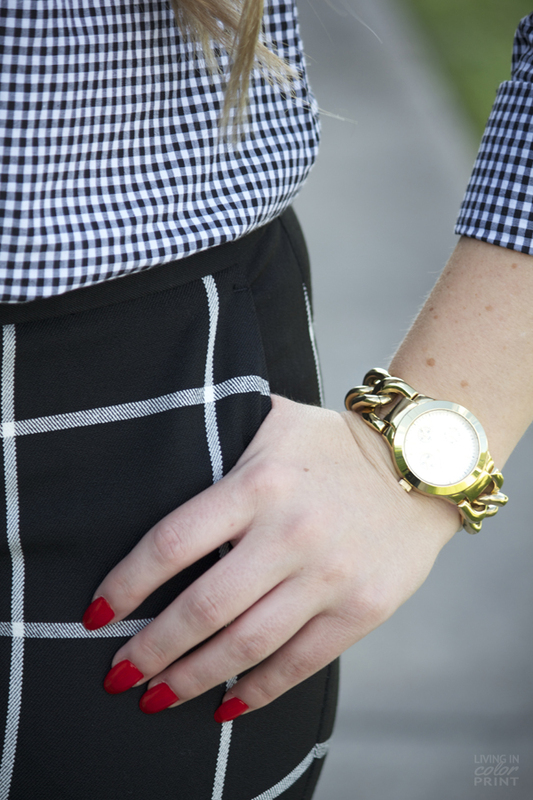 I love the gingham + checks! It looks great together! what a fun print mix! the windowpane pants look amazing on you! lovely outfit! I realy like the print on the pants! I would’ve never thought to put gingham with checkers, but it looks really cute! I love how you combined these prints! Gorgeous look. Love this combo! I wouldn’t have thought to pair windowpane with gingham, but it’s perfect together! PS- I’d love for you to stop by today to link up!